Take it easy and rest while you restore. 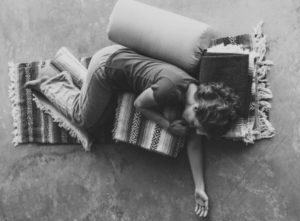 This class blends gentle stretching, slow fluid movement and restorative poses with a focus on relaxing and breathing into the deepest layers of the body to return to a place of release, surrender and calm. During the class, we will explore well-supported poses to restore your natural rhythm, calm the nervous system, dissolve tension and cultivate a deep sense of well-being that will support you well after the session is over. You will use straps, soft blankets, blocks, and bolsters so the body opens gently into the stretch. While supported you will be guided through a relaxing meditation with a keen focus on the breath. Hands on adjustments are given with essential oil blends to help enhance the experience. A class that will improve joint flexibility, free stagnation in the muscle tissue, lubricate the joints and foster a quiet, meditative state. Sending you peacefully into a brief vacation. Accessible for all levels, ages and body types. Accessible for all levels, ages and body types.